Advanced Squad Leader (ASL) is a tactical-level board war game, originally marketed by Avalon Hill Games, which simulates actions of approximately company or battalion size in World War II. It is a detailed game system for two or more players (with solitaire play also possible). 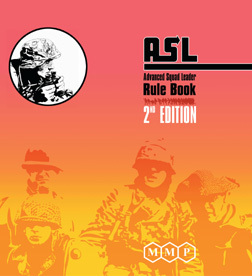 Components include the ASL Rulebook and various games called modules. ASL modules provide the standard equipment for playing ASL, including geomorphic map boards and counters. The map boards are divided into hexagons to regulate fire and movement, and depict generic terrain that can represent different historical locations. The counters are cardboard pieces that depict squads of soldiers, crews, individual leaders, support weapons, heavy weapons, and vehicles. The Winnipeg ASL Club came to existence in 1990 when Jim McLeod visited Bill Bird and suggested to that they form an actual Club. They started the Winnipeg ASL Club at his suggestion and started a newsletter as well. It was right after this that soon the success of their little endeavour fostered Jim’s idea to connect all the ASL players in Canada by forming a central organization to connect everyone. Jim kept a record of all the players and tried to make it possible for ASLers to find other players anywhere they went. The Canadian ASL Association was born and soon a national tournament. The Winnipeg ASL Club held an initial tournament in 1991 and their efforts while good intentioned fell short of success, it was their first crack at a tourney and it showed. They did meet more players both local and out of town notably George Kelln and Blair Bellamy, so that objective was met but the structure was lacking. Jim made the suggestion that they make our local efforts focused on the national level and bring players from all over Canada to Winnipeg for a national championship. They had tried to hold tournaments on their own and as part of a larger game con with mixed results. Jim ramrodded the idea forward, promoting, networking and soon they had a venue: The Viscount Gort Hotel, four blocks from their street conveniently enough, and with the CASLA Jim had the contacts. Their forays south brought some U.S. players and the Winnipeg ASL Club was the financial base. All the elements were there largely thanks to Jim’s foresight, ideas and energy. The Canadian ASL Open is, was and remains the brainchild of Jim McLeod. Jim arranged for a Piper to ‘pipe-in’ the opening ceremonies and having everyone toast the tournament with a shot of single-malt scotch. Many more legendary nights playing ASL and downing many a shot with ASL comrades from around the world. Jim’s tournament format brought together rules and structure from many diverse sources to meld into one of the best run ASL events. The original members of the WASLC were Bill Bird, Darren Kovacs, Jim McLeod, Michael Bourgeault, and George Kelln. They started in October because the September gathering was more of a brainstorming session for issues such as club constitution, club house rules, and a rough idea of meeting procedures. They wanted to discuss all of that informally amongst themselves to be prepared for ratification in October. One of the first topics of discussion was, of course – did we really want to do this thing? Another topic of discussion was to either maintain their affiliation with WinCon or to set up on their own. In previous years Bill and Jim had informally run an ASL tournament under the umbrella of WinCon. The club was founded in part as a reaction to the organizers of WinCon. The Winnipeg ASL Club continues to foster the play of Advanced Squad Leader and the development of interested players in the Winnipeg area. While a number of the Charter Members of the Club have moved away, or left the ASL community to pursue other interests, other players have joined the club and are playing in the House League. We also try to have a presence at other gaming events in Manitoba, like JimCon or Prairiecon.